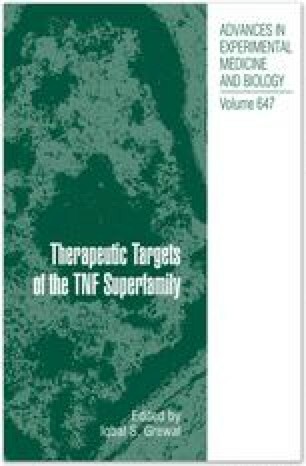 The transmembrane receptor CD30 (TNFRSF8) and its ligand CD30L (CD153, TNFSF8) are members of the tumor necrosis factor (TNF) superfamily and display restricted expression in subpopulations of activated T-and B-cells in nonpathologic conditions. CD30 expression is upregulated in various hematological malignancies, including Reed-Sternberg cells in Hodgkin’s disease (HD), anaplastic large cell lymphoma (ALCL) and subsets of Non-Hodgkin’s lymphomas (NHLs). Increased CD30L expression was found on mast cells within HD tumors and preclinical and clinical studies with compounds targeting the CD30/ CD30L system in HD and ALCL demonstrated therapeutic benefit. Upregulation of CD30 and CD30L is also linked to leukocytes in patients with chronic inflammatory diseases, including lupus erythematosus, asthma, rheumatoid arthritis and atopic dermatitis (AD). Preclinical studies conducted with transgenic mice or biologic compounds suggested important regulatory functions of the CD30-CD30L system in various aspects of the immune system. Such key regulatory roles and their low expression in normal conditions combined with increased expression in malignant tissues provided a strong rationale to investigate CD30 and CD30L as therapeutic targets in hematologic malignancies, autoimmune and inflammatory diseases. In this report, we review the pharmacodynamic effects of specific therapeutic compounds targeting the CD30/CD30L system in preclinical- and clinical studies.